It was when the rains came, and the tourists went away. The first year the bills piled up on the mantelpiece at home, one pile per week, carefully bound with a rubber band, the total owed marked on a Post-it on top. At first there were two, then four and later eight piles, sitting there as a constant reminder of our empty dining room. The rain cut off roads and flooded fields, seeping into our subterranean bedroom at home, filling it with the smell of damp concrete and mold. Subsequent years were never as bad as the first, but every fall after that, as the days shortened and our bank account dwindled, my heart broke a little as we dug in for an isolated, depressing winter. That was some time ago, but the scars still remain. Every year, even now, when I step outside and feel that the light has changed, that it is fall and that summer is gone, I fight down a rising panic. It will be all right, I tell myself, over and over, until eventually I believe it enough to keep going. Coi is one of the more unusual "cookbooks" I've read lately. It's not so much the format, which pairs a thoughtful one-page essay with each recipe, nor even the initially somewhat distracting decision to put all the ingredients and quantities for those recipes in a separate index at the back of the book. And while Patterson can wax seriously eloquent about what inspires his dishes and how to cook them, it wasn't entirely that either. What was so striking was his willingness to provide these personal and often brutally candid insights into the fears and frustrations of being a professional chef. The restaurant business is a weird and particularly tough one that seems to be constantly teetering between success and failure, both on a macro and micro level. In a sea of competition, it's hard enough to figure out what's going to capture the dining audience's interest. Then you actually have to make it work. Even when you do, this year's hot-spot can quickly turn into next year's has-been. Get all the big things right, and you're still only as good as your last plate: some line cook screws up the seasoning or cooking time on one dish, or your server is having a lousy day, and a customer leaves with a bad impression that you may never have a second chance to remedy. When a dish is right, there is synchronicity between form and substance, idea and execution. 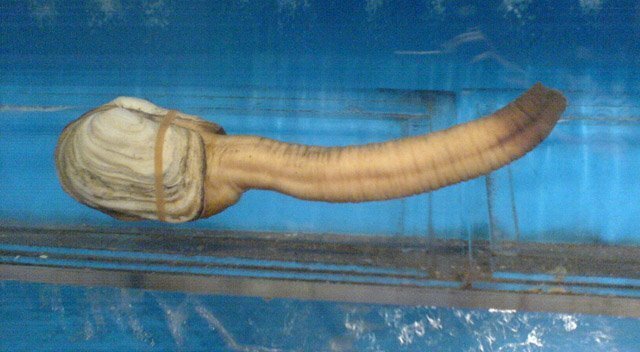 This is a dish that was meant to be challenging to make, impractical to reproduce. There is something about its unreasonableness which makes it more impactful. For it to work, everything has to be perfect. ... But I came to love it most for what it represented to me: intuitive, handmade cooking. Each rose is a little different, and I can pick out who made which one every night. The seasoning is finely tuned, wobbling on the edge of sweet and savory, always close to tumbling into failure. That sounds a little crazy, but yeah, I'd like to experience that. Because as good a writer as he is, Patterson is pretty universally recognized to be an even better chef. And yet I'd never paid a visit to the restaurant from which the book takes its name. My travels to the West Coast are almost always with family, which means my opportunities to do tasting menus are limited. And other, shinier objects always seemed to beckon. Then a month ago, Patterson announced that he was stepping down as executive chef at Coi and handing over the reigns to chef Matthew Kirkley in January. It was a surprising announcement: first, because Patterson's work at Coi has been so highly regarded, but even more so because it has been so definitively Patterson's restaurant, and his style of cooking is so personal, that the two seemed inseparable. When it comes to what a marketing wonk would call 'brand clarity,' we don't do ourselves any favors. ... When someone asks, 'What's the food like?' the best thing I can come up with is, 'Um, hopefully delicious,' my voice rising at the end in a note of uncertainty. For this farewell tour of sorts, Patterson has seeded the menu with several "greatest hits," and his "California Bowl" is one of those. It's really just an elevated version of chips and dip using some of the basic tropes of California hippie cuisine: brown rice, avocado and sprouts. 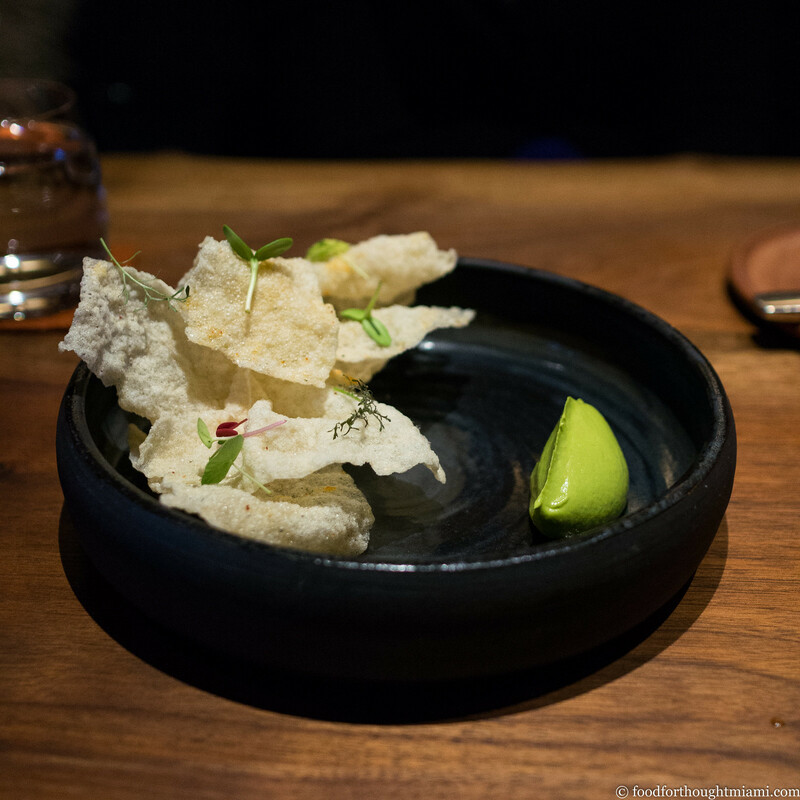 But those chips (made from rice cooked down to a paste, dehydrated, then fried like chicharrones) are light and airy and have a tingle of spice, the avocado is whipped until soft as a cloud, and zinging with lime, the tiny greens have bright, fresh, intense flavors. 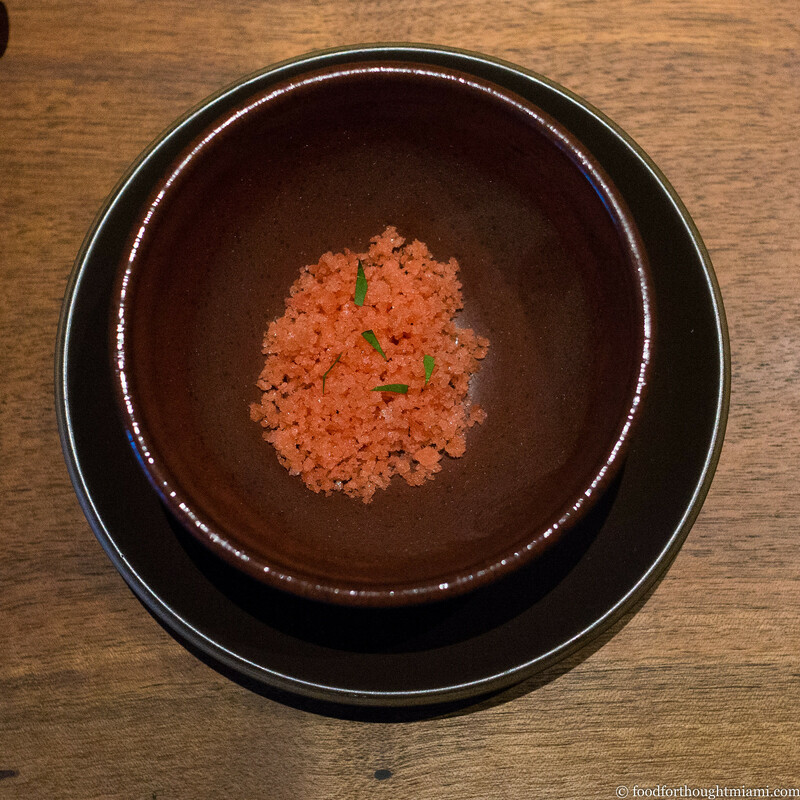 A simple looking granita of Santa Rosa plums follows, and surprises in that it's not really sweet at all. Rather, it comes on with an aggressive dose of salt and acid, plus the grassy, vegetal cut of papalo, which recede to reveal the fruit as the granita melts on the tongue. 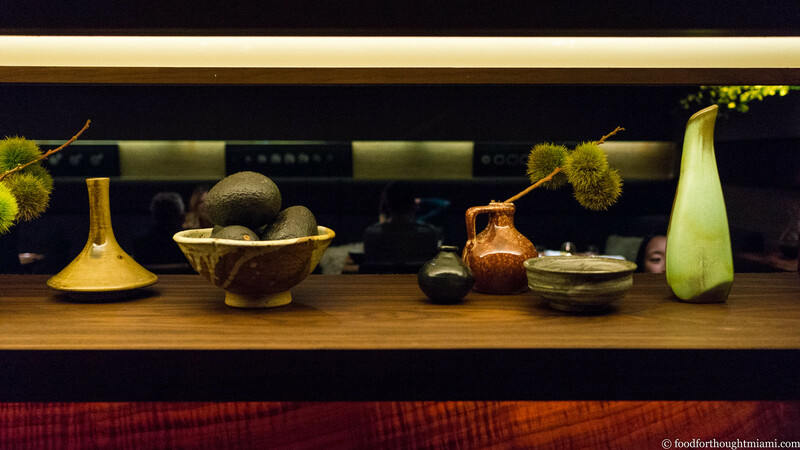 Coi is part of a well-established tradition of restaurants that serve expensive tasting menus. We are mindful of that history, but there are some aspects of an haute cuisine dining experience that feel more symbolic than heartfelt, like building the menu around a procession of luxury ingredients. Products like truffles and caviar are expensive, but they aren't hard to find or challenging to prepare. They don't carry any particular emotional value for me, just the wan connotation of a bygone era when waiters wore white gloves. Nothing wrong with that, it's just not how I cook. Well, sometimes exceptions can be made. I, for one, would never turn down this mound of caviar, served over a poached egg yolk nestled next to some silky creme fraiche sprinkled with chives. 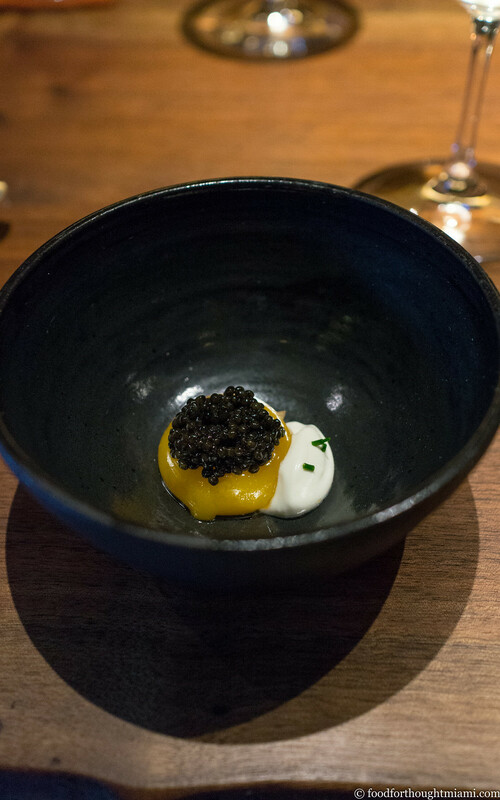 Again there's another little surprise: the gooey yolk has been imbued with the flavor of the smoked oil in which it was poached, the combination of roe and smoke bringing to mind the grill-smoked caviar served by Victor Arguinzoniz at Etxebarri. 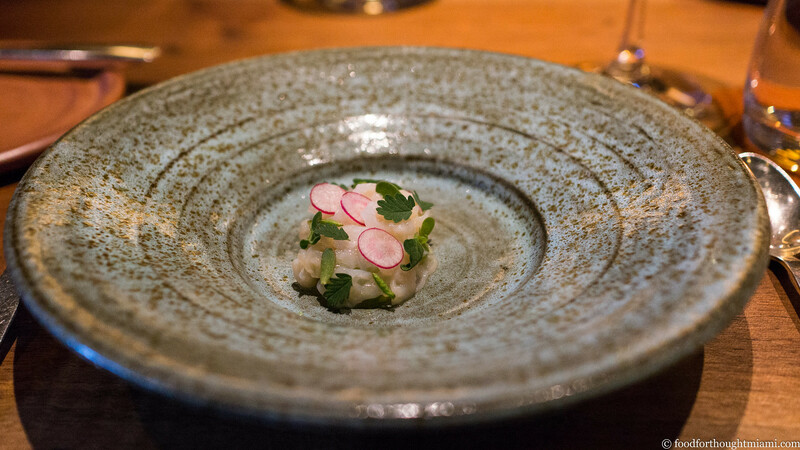 The "official" menu as listed online begins with a seafood course: geoduck. Thin poached slivers of the obscene clam are served cold, mounded onto minced cucumber that also just rings with salt and acidity (in several instances, individual items are seasoned very aggressively, so much that they seem out of whack on their own, but in combination with the rest of the dish balance out), and speckled with slivered radish coins, salad burnet leaves and little beachside succulents. There are few things as simply good as a ripe tomato straight from the garden. This dish, despite the extra elements and finessed presentation, came across as an attempt to recreate that sensation. The tomatoes are juicy, sweet, peeled red and orange cherries. They sit on top of a creamy purée of wheatgrass and grilled zucchini, the health food store staple imparting a bittersweet, grassy, licorice note that cuts through everything else. 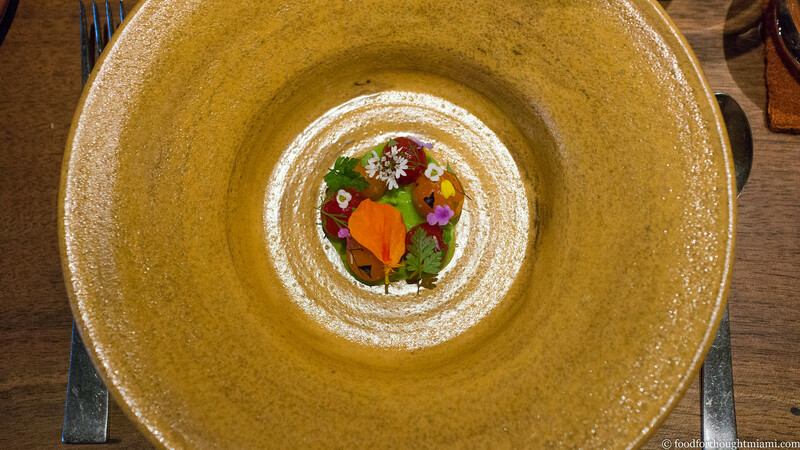 A miniature bouquet of flowers and herbs finishes the dish. 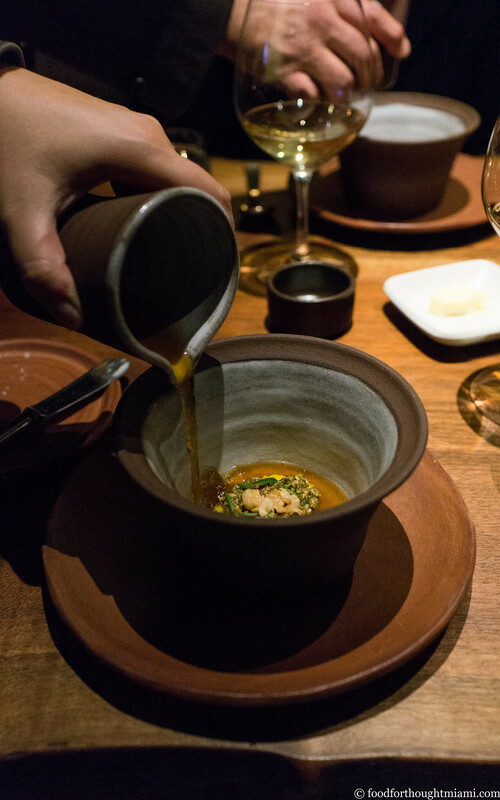 The next dish featured corn in several iterations – an airy sort of soufflé floating in a golden-brown, slightly smoky broth, with golden puffed hominy kernels on top. A roughly chopped paste of pumpkin seeds and chiles invoked the flavors of a Mexican mole sauce, while tiny huacatay leaves provided an element of brightness. 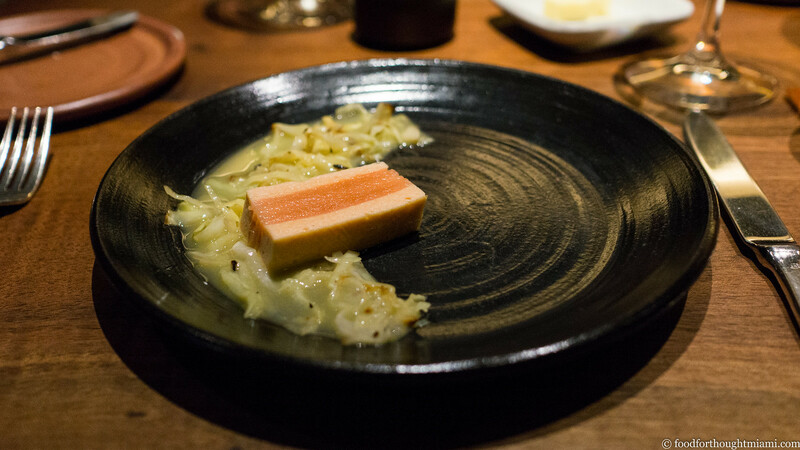 In one sense this trout course was unlike anything I'd ever had before: the fish was layered in a sort of mousseline between thick blankets of soft, creamy yuba skins, then served over charred ribbons of cabbage anointed with a sauce of dried scallops and ginger. And yet this unorthodox pairing of delicately poached fish, hearty cabbage and tangy sauce somehow also immediately brought to mind a seafood choucroute. It was a great combination. 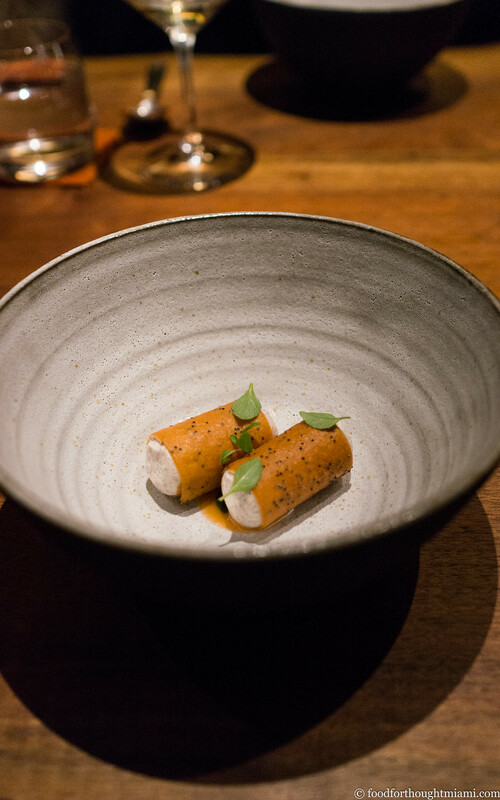 Another dish from the Coi "greatest hits" collection, which I already wrote about a couple weeks ago. 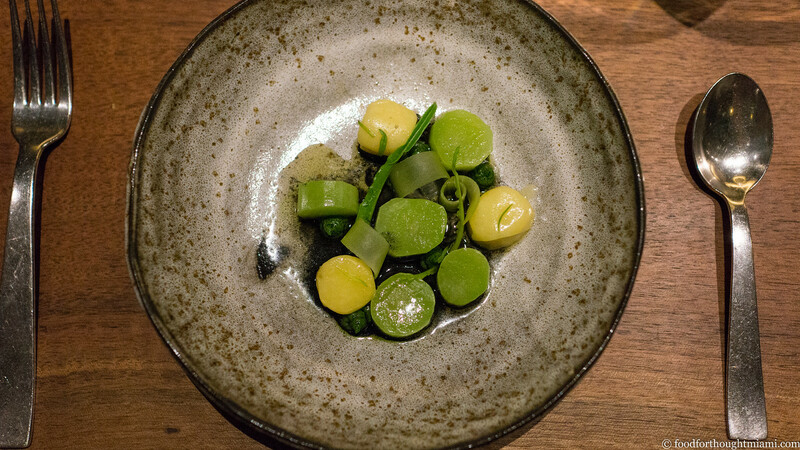 The primary ingredient is celtuce, featured both in thickly sliced discs and thin ribbons of its stalk. It has the hearty snap of a broccoli stem, and a delicately bittersweet flavor somewhere in the neighborhood of lettuce, celery and asparagus. Freshly dug potatoes are cooked until just tender, and crowned with caps of nutty, buttery melted comté cheese. These sit over an oil blackened with powdered burnt hay. Those black and charred aromas are brought back to green and fresh by a few wispy leaves of tarragon. It should be light and flavorful, sweet and sour, complex from the fermented fish. When it's right the parts meld into an indivisible whole – it's hard to explain, but there's an 'aha' moment where it suddenly becomes a great sauce. The next bite operates as a wake-up call before moving into the proper desserts. 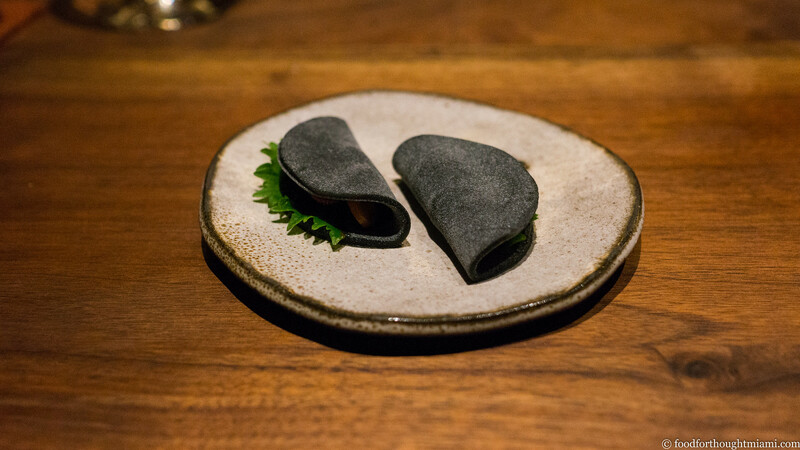 A black sesame mochi, with that chewy, squishy texture that's so alien to most Western palates, is wrapped like a taco around a filling of strawberries, kumquat jam, and shiso leaves. These are all bracingly intense flavors: the tangy berries, the puckeringly sour kumquat, the herbal blast of the shiso. Then the next bite soothes. Gorgeously fragrant, sweet cubes of musk melon swim in a soup of their juices, intermingled with lemon flavors (something herbaceous here: lemon verbena?) and topped with a scoop of coconut sorbet. It's simple. And stunning. By comparison, the finale underwhelms a bit: cute little poppy seed flecked cannoli shells, filled with a peach cream and topped with a scatter of basil leaves. The peach flavor seems muted rather than enhanced by the creamy filling – a minor disappointment, since there are few things I love more than a ripe juicy California peach. 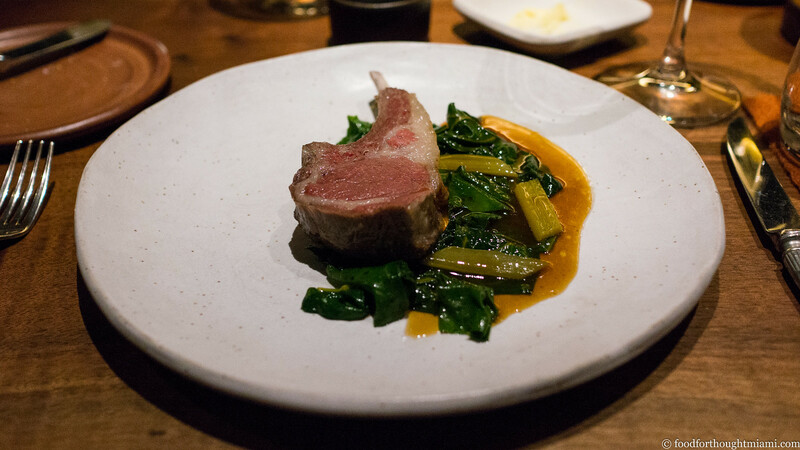 A meal at Coi is not one with a lot of fireworks or theatrics. This is not flashy cooking. It doesn't lack for finesse or intrigue, but it's just not designed to bowl you over with its technique or presentation. Instead, there's real grace here, great ingredients whose flavors are amplified, harmonized, and brightened, sometimes in subtle, unanticipated ways. Daniel Patterson is more Thelonious Monk than Art Tatum. And like Monk, his is also a uniquely personal style. I'm sure Coi will be a great restaurant with Matthew Kirkley in the kitchen. But it just as surely is not going be the same restaurant. "It’s like when the light changes in the fall, and you know it’s not summer anymore,” says Patterson. “I just felt like this was something that needed to happen." Cooking is all about balance. In many ways, so is life. It sounds like Daniel Patterson is looking to readjust the balance in his life. I hope he gets it right. 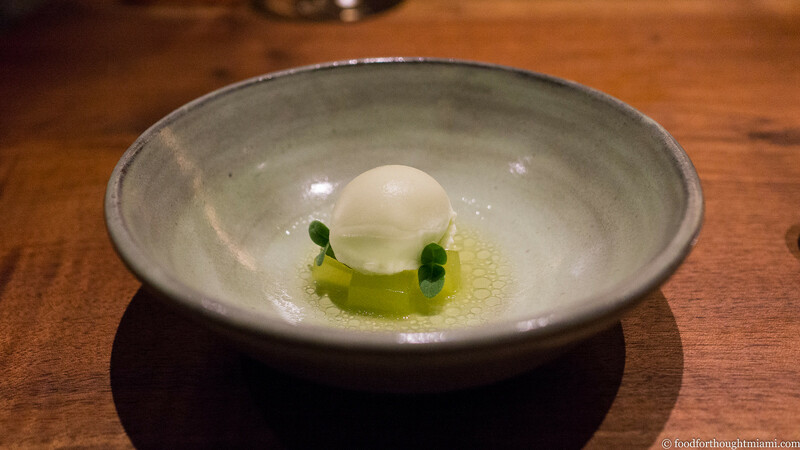 As I noted in an earlier post, it is a peculiar coincidence that I happened to catch Kirkley in the last months of his work at Chicago's now-closed L2O, which was one of the best meals I had in 2014. So I feel as if I wrote a eulogy for Kirkley's L2O, and am now writing one for Patterson's Coi (even though it will live on with Kirkley in the kitchen). While it is an unusual move for Patterson to step away despite how closely the restaurant has been associated with him, I think Coi is going to be in some very good hands with Kirkley. I also think Patterson, with LocoL (a project he is doing in conjunction with L.A. chef Roy Choi to create healthy fast food restaurants that will serve and employ members of under-served communities), has a chance to do something that is ultimately a lot more valuable and rewarding than crafting haute cuisine tasting menus. In retrospect, I think this is a dinner both they and I wish I'd done solo. It was the first night of our arrival in San Francisco, and despite having given me leave to book a tasting menu, they were not in the mood. It did not help that despite the relatively abbreviated format – twelve courses total, including the preliminary bites not listed on the menu – our dinner stretched out for over four hours. Even for me, that's just too long for all but the most extraordinary of experiences. Patterson's often understated style also rewards the kind of attention and contemplation that solo dining permits. At Coi we French (remove the fat and clean the bone) only about 1 inch (2 cm) at the top of the bone. it's a nod to tradition, and to show that we know how to do it, but we want to leave the best, most fatty part of the rack attached to the loin, because it tastes great. I learned how to play piano as a kid, and [Monk] was my hero, with his jerky syncopation, idiosyncratic voice, and harmonic dissonance that would resolve, when you couldn't stand it any more, into the sweetest melody you'd ever heard. His sense of musical balance was perfect: complexly wrought, deeply human. Three notes and you knew who was playing, and there aren't many piano players you can say that about.